Yes, I went to the University of Missouri. And, yes, I did teach classes at the MU Student Recreation Complex. But since graduating in 2003, that nice rec that I taught group exercise classes at was expanded to a massive (and I mean, MASSIVE) fit extravaganza in August of 2005. And let me just say, I am green (or maybe more appropriately for Mizzou, Tiger-striped) with envy that I wasn’t born later to enjoy it. 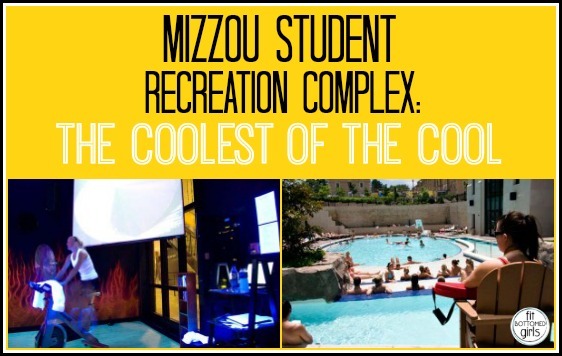 The MU Student Recreation Complex has a ton of amenities and features. They’ve got the basic sports courts, cardio equipment and weight equipment. They also have a rock-climbing wall, track, tennis courts and a competitive pool. And then there are the other options that seriously make my jaw drop and wish I was back in college again (despite what I said on Monday). According to Emily Bach, associate director of the complex, its Tiger Grotto is probably the most unique—and I’d have to agree. The Grotto is more like a resort than a college rec center with a zero-depth pool entry with a high-powered vortex, a lazy river, waterfall, hot tub, sauna and steam room. Seriously, I would pay them to work there these days. Then, there’s TigerX, the group-exercise program. Yes, I am biased, but it’s amazing. With more than 100 classes offered a week (yep, you read that right), you can take anything from Zumba (even offered in the water!) to Ballet Bootcamp to Tabata to Sunrise Cycle. It’s an aerobics heaven. And if that wasn’t enough to get your fit bottom smiling, try zouLIFE, the complex’s wellness programming that pairs personal care and well-being services like massage and skin care with personal fitness and nutrition. So, it’s no wonder that a whopping 5,500 students use the complex in an average week. It’s seriously the place where all the cool kids hang out—and by “cool kids,” I mean all the college students who know what’s up! this opened up RIGHT after i graduated. if it didn’t make me sad that i helped pay for this with my student fees, it was salt in the wounds that both of my siblings talked about how awesome this was for their use! now, i am even more jealous that i don’t know anywhere in kansas city that provides the insane variety of tiger x! I think the rec center is one of the BEST things Mizzou has to offer. I miss it so much — can’t believe I took that for granted!